It is with great pleasure that I am here this evening to accept the 12th CARICOM Triennial Award for Women. I am deeply honoured to be among that esteemed group of Women who have been bestowed with this prestigious award, to recognise the contribution they have made to the socio-economic development of the Caribbean. I am among some giants. I must say that I am happy, excited, but also extremely humbled that you saw it fit to present this award to a woman from the working class. Who would ever have thought that I Shirley Pryce who spent most of my life working as a Domestic Worker could be standing here before you to receive this award? This award is very much appreciated, but perhaps the greatest award I have ever been given is the simple opportunity to advocate for the thousands of voiceless women and men across the world fighting for their rights, for recognition, respect, and overall decent work. I stand here tonight to represent domestic workers across the Globe. I represent their aspirations and the empowerment that this award means to all of them. I wish to take this opportunity to express my sincere gratitude to the dozens of people without whom this experience would not have been possible. These include civil society organisations, NGOs, the Jamaica Household Workers Union, the Caribbean Domestic Workers Network, the International Domestic Workers Federation, other trade unions, employers’ federation, the media, so many international development partners, government, opposition and the private sector. I wish to thank especially my previous employers and my current employer, the National Housing Trust, Jamaica, for their tremendous support for my global activism and advocacy. My heartfelt appreciation to all of you. I wish to recognise Prime Minister, the Hon Andrew Holness for his sterling support for the rights of domestic workers and also to former Prime Minister, Portia Simpson–Miller, who has provided tremendous support for the Jamaica Household Workers’ Union over the years. To my family and friends, I express my sincere gratitude for your love and understanding, and thank my son and daughter Vanesa and Kareem, who are here to share this wonderful moment with me. Ladies and gentlemen, if this award stands for anything, it stands for the united spirit in all of us, even though it has my name on it. I achieve because we achieve and we achieve because we meet the challenges together! Our History as Caribbean people has been one with surmountable challenges; challenges which we have fought and overcome and the challenges we continue to experience, trying to improve the socio-economic life of our people. We remain resolute and determined to fight and win. As I accept this award I would like to say to everyone here sharing in this special moment, that what we are doing today is planting a seed for change for the future. My motto is BE BOLD FOR CHANGE. I believe in ‘Making a Difference’ in all the issues affecting the human rights of women across the globe. I am extremely passionate about reducing the scourge of violence against women and girls, which has reached an unprecedented level in the region and the world. Governments, Prime Ministers, Presidents and all other leaders, we need your support to bring this blight on our societies to an end. Be Bold for Change. Our women and girls must feel safe, feel valued and be free from violence. We need stronger laws to protect the vulnerable and to bring the perpetrators to justice. We all have to Be Bold for Change. We need to speak out whenever the opportunity presents itself. I pledge, to continue to fight for the sweeping changes in the laws that are needed across the region to protect the rights of women, especially domestic workers. According to the ILO, there are over 100 million domestic workers worldwide, and yet domestic workers do not enjoy the benefits which workers in other sectors have, such as maternity leave, sick leave, health insurance and leave with pay. Although in some areas there have been improvements, the one thing that remains the same is that domestic work is not recognised as real work. Even though some countries have taken the important step to introduce legislation, a lot more work is needed in enforcement. I’d like to ask members of the audience to take a moment and reflect on what a home without a domestic worker would be like. I firmly believe that life can be better for all when the lives of domestic workers are improved. It was domestic workers across the globe who came together and lobbied the ILO for laws to protect their rights and improve their working conditions. Our efforts were met with success with the adoption of the landmark Convention 189 in 2011, which established the framework for the protection of the rights of domestic workers. I am therefore imploring all Governments here today, to follow the footsteps of Jamaica and my Prime Minister, The Honourable Andrew Holness and the initiative of Guyana, those being the only 2 CARICOM countries to have ratified Convention 189 so far. I hope to change that. It must be about Decent Work for all. 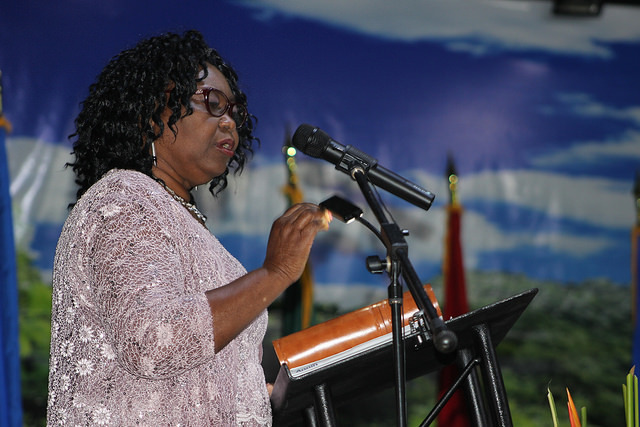 I wish to express my deep appreciation to CARICOM and to the Heads of Government for being Bold for Change, in honouring a working-class woman with this award. In doing so you have honoured domestic and working-class women worldwide and for this we are very grateful. So, it is on their behalf, that I accept this award with pride. I will continue to be an ambassador for women for my country, the region and the world.